Allu Arjun is getting ready to rock the box office with his latest entertainer S/o Satyamurthy. The movie is gaining widespread attention as the release date is nearing. This movie has completed all its formalities and it will release on 9th of April all over the world in a record number of screens. The censor team has issued an U/A certificate for this flick. Sources say that Trivikram Srinivas, the director of this film has trimmed a spicy scene in the movie. 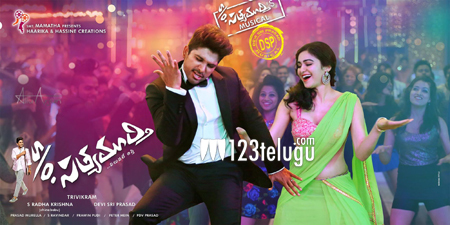 It is heard that there is a 30 second lip-lock scene featuring Allu Arjun and Adah Sharma. This scene was removed by the director himself before the censor screening. Produced by S.Radha Krishna, this movie has Samantha, Nitya Menon and Adah Sharma as female leads. Music sensation Devi Sri Prasad has given an out and out commercial music album which is already creating ripples in the market.